Even when the leaves start changing, things are still hot at NY Party Works. Fall and winter events can be just as spectacular as your summer parties. There’s so much to celebrate and now’s a great time to plan your celebration. That’s because we have some of the newest and hottest party rentals on the market today. 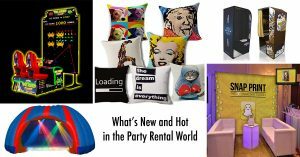 We’ve been in the party rental business since 1993, and we know what makes an event memorable, so take a look at some of our red hot rentals. When you think of parties, photo technology has changed the whole game. Sure we love our Old School Classic Photo Strip Booths, which will give you two duplicate strips of four photos. But technology has evolved in some fun ways. Our Mirror Me Photo Booth is a unique way to take selfies. Touch the mirror to take a photo and the mirror will also lead you through the process. You can write on the mirror and the looking glass will even give your guests compliments. One of the best ways to take fun photographs is on social media and one of the best ways to do it is through Snapchat. Now you can bring Snapchat right to your party or event. With NY Party Works’ Snapchat Station, you can take photos or make brief videos. Then you can add all of the things that make Snapchat fun. We have the lenses, sound, and filters available at this station and all of the photos taken at your event will be displayed on a large screen. NY Party Works can bring you to another world and also bring you classic aliens from another world. One of our hottest products allows you to step out of your reality and step into our Virtual Gaming Experience. You will be transported to a 3 dimensional visual reality world and play some of the most cutting edge games with a Sony VR headset. As you’re immersed in adventures ranging from racing to a trip to a shark tank, guests at your event will be able to monitor your activity on a large overhead monitor. If you love classic video games, prepare to defend our planet with Space Invader Frenzy! You don’t need quarters to play this iconic game. It’s an update of the classic arcade game which allows two players to compete at the same time. What’s a party without dancing? NY Party Works doesn’t just provide you with MCs, DJs and Dancers, we can give you with a dance party space. It’s our Lounge Dome and it’s a blast! Thus inflatable lounge has LED lights and you can supply music with your electronic devices or we’ll provide you with a DJ. NY Party Works can also set you up with some memorable and unique party favors. One of our most visually interesting party favors are Meme Pillows. You can choose the fun and artsy designs which can depict, cartoons, movie stars, pets, funny sayings or brand logos. They’re great conversation starters. Another great party gift isn’t permanent. They’re our Flash Tattoos. These stylish metallic looking temporary tattoos are inspired by jewelry design. They’ll look great on you and last for 4 to 6 days. At NY Party Works, we always have our ears to the ground for the latest trends in party rentals. We know what’s hot and we can help make your event hot. To get started, contact NY Party Works today.